When the United States entered World War II, there was a desperate need for a medium tank engine. Chrysler responded with a very unusual idea. Chrysler had its 251 cu in (4.1 L) straight six-cylinder, L-head engine available in large numbers. Under the direction of Executive Engineer Harry Woolson, the Engine Design department, headed by Mel Carpentier, designed a new powerplant that utilized the 251 cu in (4.1 L) engine. The basic idea was to combine five of these six-cylinder engines into a five-bank, 30-cylinder, single engine for medium tanks. This new engine, referred to as the Multibank, was given the designation A57. 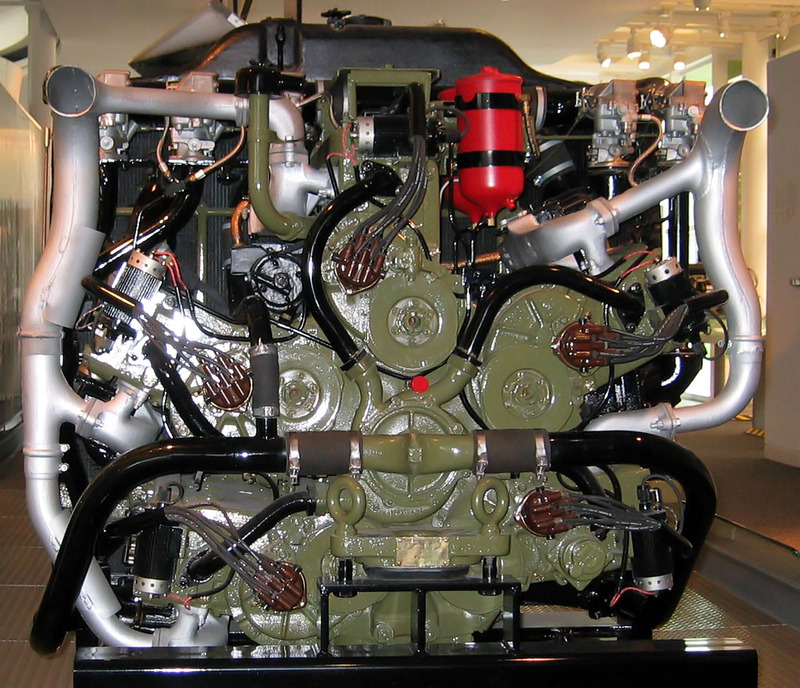 Chrysler A57 engine as displayed at the Walter P. Chrysler Museum. Note the central water pump feeding the five engine banks, the individual distributors for each engine bank, and the row of carburetors at top: three on the left and two on the right. The Multibank A57 engine had a large cast iron crankcase that formed the central structure of the powerplant. Five Chrysler 251 cu in (4.1 L) six-cylinder engines were bolted to this central crankcase. Two of the engines were bolted to the lower portion of the crankcase, one on each side, with their cylinders angled 7-1/2 degrees above horizontal. Two addition engines were bolted to the crankcase above the first two, with their cylinders 27 degrees above horizontal. The fifth engine was bolted vertically at the top of the crankcase. The five six-cylinder engines made up the banks of the A57. The A57 engine was mounted in the rear of the tank, and the crankshaft output flanges faced the front of the tank. The A57 retained the five crankshafts of the five six-cylinder engines. A drive gear was coupled to the crankshaft of each engine bank. 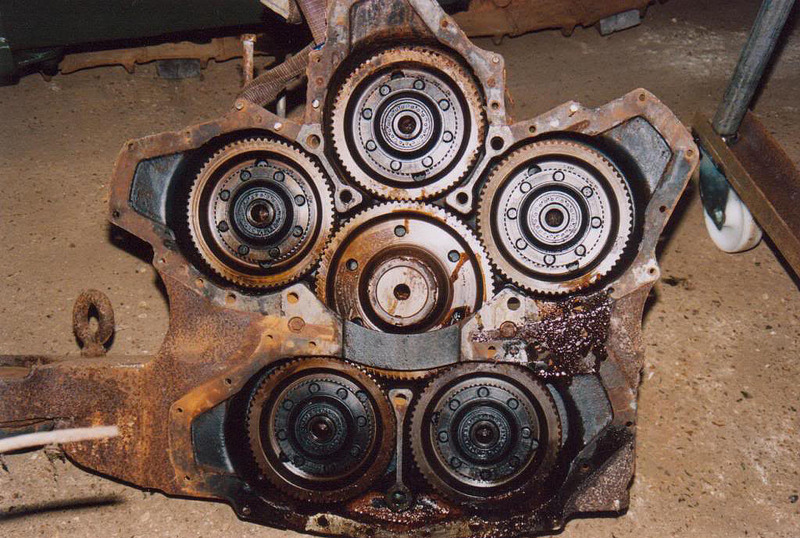 These five drive gears meshed with a single, central gear (all gears had herringbone teeth). The central gear drove the output shaft of the power plant. The output shaft went through the radiator and drove the cooling fan and clutch, which was attached to a drive shaft and then transmission. The A57 was originally equipped with five belt-driven water pumps. However, the belts would often break because of the alternating loads on the crankshaft pulleys. The design was changed to a single water pump with five outlets (one for each engine bank). This single water pump was driven by an accessory shaft from the central drive gear located on the opposite end of the central crankcase. Also at the rear of the tank, each engine bank had its own ignition coil and distributor that was gear-driven from the camshaft. The first production engines had a single-barrel carburetor mounted directly on the intake manifold for each of the five engine sections. The different pipe lengths and contours leading from the air cleaner to the carburetors resulted in unequal fuel distribution. Metal vanes were added to direct airflow, and ultimately the five carburetors (each connected to its respective engine with a downpipe) were relocated in the same plane above the engine. This change simplified throttle linkages, the air cleaner arrangement, and maintenance. The A57 Multibank had two oil pumps located in the central crankcase. One oil pump was a scavenge pump to transfer oil to a remote reservoir. The second pump was pressure pump that took oil from the reservoir and delivered high-pressure oil to all five engine sections. The 5,244 lb (2,379 kg) Chrysler A57 engine package being installed in a M4A4 Sherman tank. Note the engine’s size in comparison to the installers. The A57 engine had a 3.4375 in bore and 4.50 in stroke, giving a total displacement of 1,253 cu in (20.5 L) from its 30 cylinders. The engine produced 445 hp (332 kW) and 1,060 lb ft (1,437 N m) of torque at 2,400 rpm. Given the arrangement of the engine sections, the Multibank was a relatively short but heavy engine, weighing 5,244 lb (2,379 kg) including radiator, cooling fan and clutch. 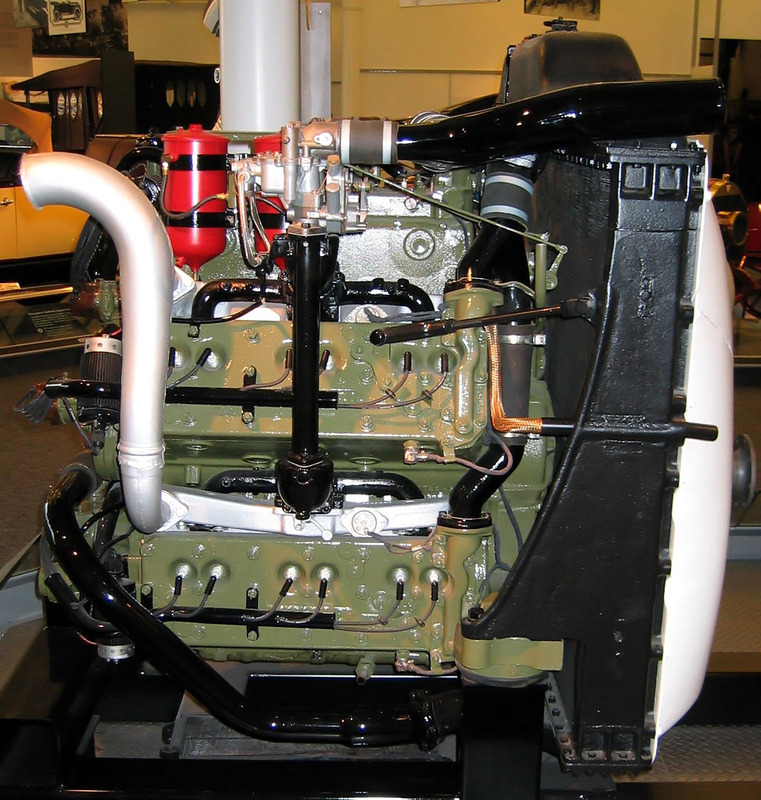 Construction of the A57 utilized existing tooling from the 251 cu in (4.1 L) Chrysler six-cylinder engine, and the engines shared cylinder blocks, cylinder heads, pistons, connecting rods, and crankshafts. On 3 June 1942, nine months after the initial engine discussion, the first of 109 M3A4 tanks were built with the A57 engine. However, the M3A4 tank was quickly replaced by the M4A4 Sherman tank, the first being produced on 30 June 1942. From April 1942 to September 1943, 9,965 Chrysler Multibank engines were built; 7,500 engines were installed in production tanks, and the remainder were built as spare engines. 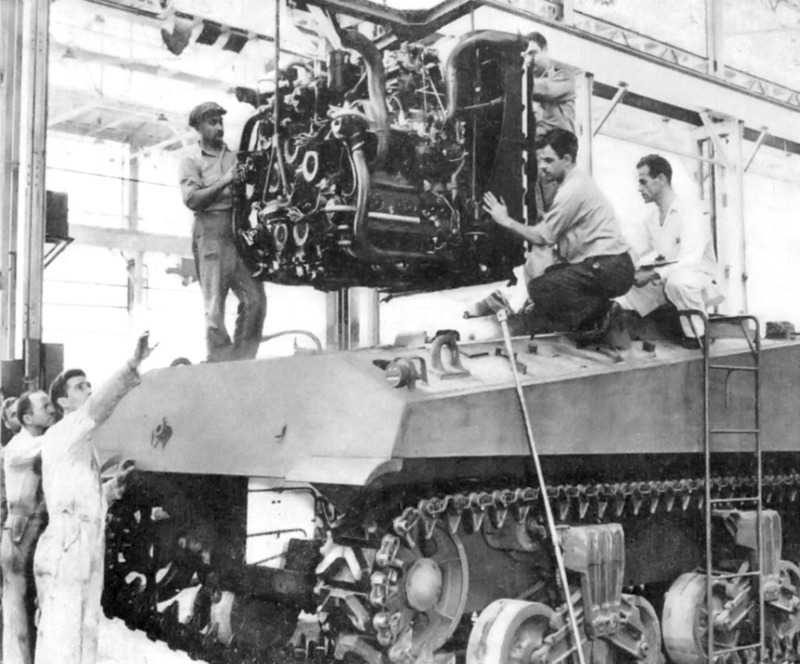 The A57 engine proved to be a very durable, reliable, and efficient power plant for medium tanks. Reportedly, the engine would still run with two of the five engine banks disabled from combat damage. A number of Chrysler A57 Multibank engines survive, and some are still in working order in restored tanks. Side view showing the relatively short length of the of the A57 engine at the Walter P. Chrysler Museum. While similar engine concepts, no direct relation has been found between the Chrysler Multibank and the Perrier-Cadillac 41-75. This entry was posted in Automotive on 5 October 2012 by William Pearce. The different lengths of intake manifolds used to reach each cylinder bank required due to placing all the carburetors at the same horizontal level above the ground must have affected performance negatively. I suppose the latter were all placed high on the engine like that as a compromise for river fording purposes and the like. Thank you for your comments. I’m not sure why I did not write more on the carburetors (I’ve added more now). Fuel distribution was always a problem because of the different pipe lengths leading from the air cleaner to the carburetors. Metal vanes were added to direct airflow, and ultimately the carburetors were relocated in the same plane above the engine. This change simplified throttle linkages, the air cleaner arrangement, and maintenance. While the relocation did not solve all problems, it was an improvement in many ways. Thanks for posting this article. A Chrysler engineer by the name of Burt Dickenson eventually resolved the fuel flow problems with this engine. I was fortunate to have enjoyed a detailed explanation by Burt (as to how he solved this dilemma) given to the members of the Detroit Region Plymouth Owners Club at one of our meetings. Regrettably, Burt has passed but not before I got a chance to know him and appreciate the brilliance of his mechanical mind. Thank you for posting this information and adding more to the Chrysler A57 story. Were burnt pistons a problem with the crude intake system ? I do not think burned pistons were an issue. The engine was operated at 2,400 rpm prop shaft speed, and I do not think much pre-ignition or detonation would occur. I think the main issue with the original configuration was having five carburetors located in different positions. This made the throttle linkages rather complex and inevitably forced the carburetors out of sync. Mounting the carbs together resolved most of the issues.